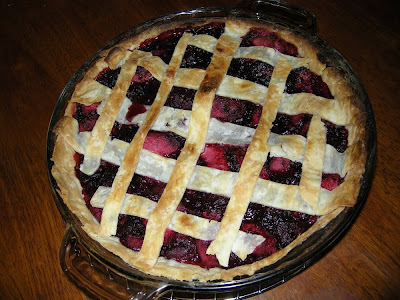 This is a wonderful, delicious pie. A very summery pie and is perfect served chilled. It was inspired by leftover pulp from a recent batch of homemade organic jam. The pulp contained pectin and was full of pips but also tasty blackberry pulp. It seemed such a waste to throw it away. So to transform it into an edible pie filling I added pomegranate juice, generous amounts of organic cooking apples, brown sugar and butter. For the pastry I tried my new recipe made with rice flour and corn flour which turned out very light and flaky, perfect with the filling.